The benefits of AMR/AMI are vast, but vary depending on which type of program is deployed. In general, Advanced Metering programs enable more accurate billing, improved customer service, revenue recovery, and resource conservation—to name a few. There’s a lot more to a successful program than just purchasing the meters. To realize the full benefits, a utility must be able to properly design, build, integrate, and maintain the systems. With the vast amount of technology decisions utilities face today, choosing the right total solution can be complicated. That’s where UMS comes in. Our team is made up of technology experts, engineers, project managers, installers, systems integrators, and software developers who specialize in the design, build, integration, and maintenance of custom programs. UMS is the only partner you’ll need. 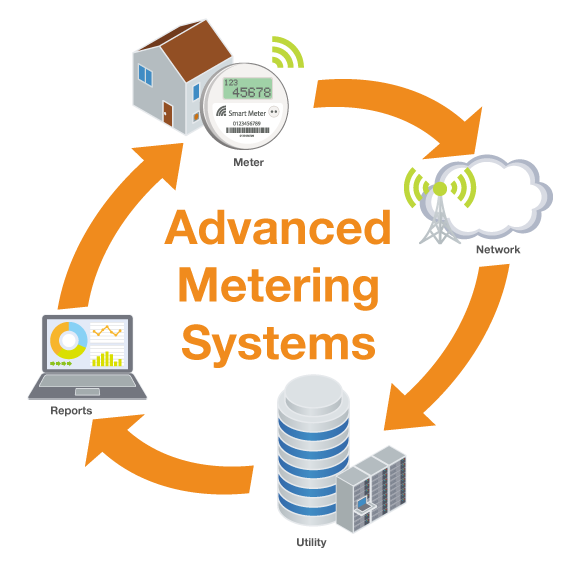 Advanced Metering is a broad term that can be used to describe Automatic Meter Reading (AMR) or Advanced Metering Infrastructure (AMI) programs. In general, the technology enables automatic communication between meters or sensors and a utility. AMR systems enable one-way communication from a meter to a meter-reading device. Data is collected at regular, pre-determined intervals (daily, weekly, monthly, etc.) by walk-by, drive-by, or fixed network methods, and is provided to the utility for billing. AMI is an integrated system of smart meters, communication networks, and data management systems that enables two-way, real-time communication between utilities and customers.